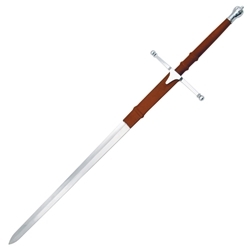 Our Steel Wallace Sword with Wood handle, leather covered grip and ricasso also has a steel guard & pommel. Even at this low price the sword includes a leather sheath. Overall length 52".